In 1955, President Eisenhower proposed to Soviet leader Nikita Khrushchev an “Open Skies” policy, which would allow overflights by surveillance aircraft over both countries to try to build more trust and allow each country to de-escalate their rampant buildup of nuclear weapons in the fear that one country had more nuclear weapons than the other. Khrushchev “shot this idea down.” (Sorry!!! No, I’m not.) 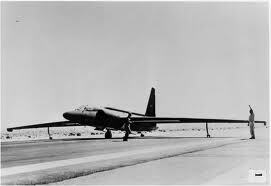 The US had by this time developed the U-2 spy plane (nicknamed “the Dragon Lady”) throughout Lockheed Aircraft’s top-secret “Skunk Works” facility. The US went ahead and began using the U-2 to attempt to determine the number and location of Soviet nuclear weapons, both inside the USSR and other Soviet-controlled territory, such as (later on) Cuba. It proved that there was no “bomber gap” between the US and USSR, which was a serious fear in the mid-1950s. Notice its glider-like appearance. The wings were so long they had their own landing gear at the tips so that they wouldn’t drag during take-off. These landing gear, called “pogo sticks” fell off t save weight when the plane took off. When the plane landed, skids on the tips of the wings protected the plane from having its wings torn off. The U-2 could cruise over 12 miles above the earth to try to protect the pilots from SAMs, or surface-to-air missiles, which could not reach that altitude. The pilots wore basically a pressurized space suit and breathed pure oxygen through a mask on their helmets while flying. The planes used specially developed cameras designed under the direction Edwin Land (the inventor of the instant camera) of the Eastman Kodak company. The film used in the cameras was very wide, so that images could be greatly magnified while remaining so clear it was said you could read a 2 foot wide sign from 60,000 feet. The planes were used mostly by the CIA, although the military had some as well. They are still being used today, 50 years after they were designed, to help calibrate satellites and in communications. On May 1, 1960 (May Day, ironically– which is also a Communist workers’ holiday and the international signal for distress on sea or air)a U-2 spy plane piloted by Francis Gary Powers, a technically civilian employee of the CIA, was shot down during a reconnaissance flight over the Ural Mountains in Russia. Even though he was not hit by the SAMs launched against him, the shock waves were enough to break the plane apart. Although equipped with a cyanide capsule, Powers survived the fall and was captured after parachuting into the heart of Russia. He was tried as a spy and given a ten year sentence, but after two years he was swapped for a Soviet spy in the first exchange of its kind. Read this: https://www.mtholyoke.edu/acad/intrel/u2.htm, which is an actual state Department document from the Office of the Historian about the incident. Pravda is the USSR official propaganda organ/ newspaper.